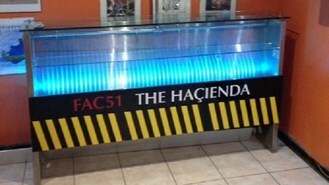 Music fans will have to spend more than a penny if they want to get their hands on a unique piece of memorabilia which has come up for sale - the urinals from legendary nightspot the Hacienda. The Manchester club, which closed in 1997, was part of the city's Factory Records empire and played host to gigs by stars including Madonna, New Order and the Stone Roses as well as being central to the rise of acid house music. Mike Shepherd, who is selling the loos as well as his extensive collection of posters and records from the time, said he ended up owning them almost by accident. He said: "There was an auction of the Hacienda back in 2001. I couldn't go but a friend of mine went and I gave him a couple of hundred quid and asked him to get me something substantial and that's what he got me. "Lots of people have got bricks and posters but I wanted something substantial and I used to fit bathrooms so it was a nice fit." The club was run by record label boss Tony Wilson and New Order and lost millions of pounds despite being packed out with revellers in its heyday. Mr Shepherd, a 48-year-old furniture maker from Manchester, has converted the urinals into a display cabinet for his collection of memorabilia, but refused to clean it after buying it. He said: "These are the urine stains of Manchester music history. That one on the left could by Morrissey's, the one on the right could by Anthony Wilson." The collection, which also includes signed posters, records and DVDs, is being auctioned on eBay with a starting price of£15,000. Mr Shepherd said he had to sell it because he is planning to move house next year. Jade Ewen has revealed that Sugababes "fizzled out" in 2011, saying things "naturally came to the end". Robin Thicke's Blurred Lines is Billboard's song of the summer. Cara Delevingne could have a successful singing career if she decides to release music, her friend Will Heard has said. Little Mix are launching their own make-up range to help fans recreate their individual looks. David Bowie has crowned his comeback this year by topping the nominations for the Q Awards. Taylor Swift has got one over on ex-boyfriend Harry Styles by clocking up two new entries in the Guinness World Records book - while his band One Direction achieved only one. Steven Tyler surprised the audience when he made an appearance at a small club in Nashville.